Another successful Pro-am has come and gone and already we're looking forward to the 2019 edition. 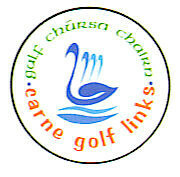 Fifty two teams competed over last Saturday and Sunday on a Links that was in immaculate condition and everything a Links should be after an extended dry spell. Congratuations to Chris and Gary and all the greenkeeping staff who merited all the good things that were said about the course. Congrats also to the new team in the Clubhouse and Lír Restaurant who coped extremely well with the demands put on them on such a busy weekend and served up great food and service to match. On the course it was yet again, Waterville professional David Higgins who came out on top who followed up an opening level par 72 with a super four under par 68 to win from Michael McGeady who was runner -up on level par. Congrats also to Eddie Treacy of nearby Ballina Golf Club who led after day one with a superb 68 and finished tied fourth. 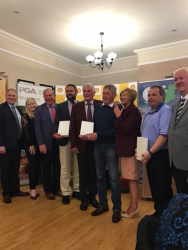 On the amateur side the winning team was that of local members Coilín Faherty, Seán O'Coisdealbha and Bearna member Gearóid Breathnach with a phenomenal score of 182 winning it by eight points from the runners -up. Professional Kenny Fahey 'brought home' the winning team. The draw for this weekend's Pro-Am was as follows. It may be subject to minor changes but essentially this is the way teams should tee off.